In the 36 States of the federation, the Ministry of Works headed by a Commissioner is saddled with the responsibility of ensuring infrastructural development of the State but most gluttonous individuals who are privileged to hold these elevated positions, in the guise of carrying out this task have devised several cunning means to loot and embezzle funds any way possible. 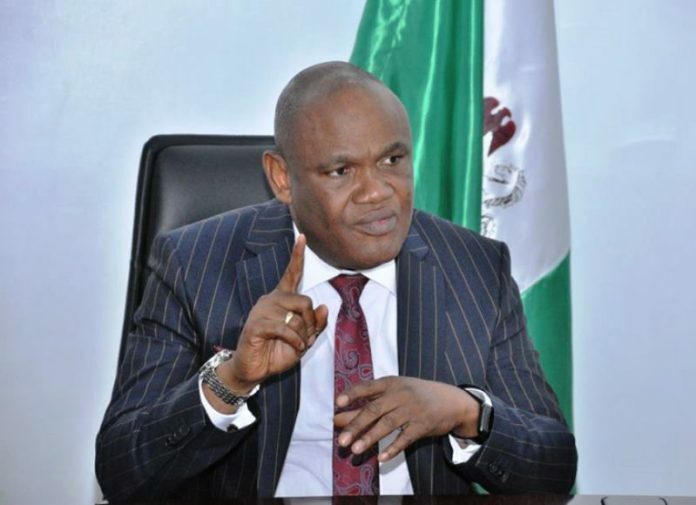 This is the exact practice of Mr Ephraim Akparawa Inyang-Eyen, the Akwa Ibom State Commissioner for Works who no doubt seems to be gaining mastery in the art of looting and embezzlement of funds meant for infrastructural development of the state especially the professional fees of Estate Surveyors and Valuers this online news medium learnt. It was gathered that Estate Surveyors and Valuers in the state who carry out professional services during road constructions and rehabilitation by the state government are usually entitled to 10% of the total agreed compensation sum to be paid to land and property owners who are affected by these constructions or rehabilitation. However, SecretReporters uncovered that since the appointment of the snake oil commissioner in 2015 till date, he has allegedly continuously diverted the 10% serving as professional fees for Estate Surveyors and Valuers which amounts to more than N500, 000, 000 (Five Hundred Million Naira). Our source who pleaded anonymity revealed that this jaw-dropping amount is the backlog of unpaid professional fees involving certain projects like the construction of Etinan-Ndon Eyo road amounting to about N215, 000,000 (Two Hundred and Fifteen Million Naira), Remodeling of Eket main town, Tropicana drainage, Construction of drainage system at Two Lanes amongst others executed by Governor Udom`s PDP led administration. It was also gathered that following a petition filed to the Economic and Financial Crimes Commission (EFCC) against him in 2018 by some aggrieved Estate Surveyors, Mr Ephraim in a bid to cover his corrupt tracks hurriedly constituted a committee and allegedly paid N15, 000, 000 (Fifteen Million Naira) only in December 2018 from the said N215, 000, 000 (Two Hundred and Fifteen million Naira) mapped out as professional fees for Estate Surveyors from the construction of the Etinan-Ndon Eyo road. Our source further disclosed that in a bid to sway the anti-graft agency EFCC into believing that he is ready to make payment, the cunning glutton allegedly quickly paid only companies owned by certain politicians with promises of paying the outstanding balances to other surveyors in installments. Estate Surveyors and Valuers in the state has called on the Governor to immediately expedite actions towards ensuring that their professional fees are paid to the fullest and the relevant anti-graft agencies to commence investigation on the fraudulent practices of the Commissioner as there are speculations that with cunning gluttons in Governor Udom Emmanuel’s cabinet like Mr Ephraim Akparawa Inyang-Eyen, his second term bid may become an unending looting spree and a free for all show for many to fraudulently amass wealth. However, as with the style of this online news medium to ensure balanced and unbiased reporting, the Commissioner of Works when contacted via his mobile line totally debunked all the allegations against him stating that they were all empty and devoid of substance as the state government has not released funds for the payment of the fees. He further stated that his duty was to supervise the process of payment of funds and the allegations of embezzlement against him by some of the Estate Surveyors is to sway him into returning to the old ways of the usual fraud in compensation payment which does not involve verification before payment commences, which is fraudulent and corrupt.